Britney’s Piece Of Me won the Best Resident Performer, Best Production Show, Best Bachelorette Party and Best Bachelor Party awards at the Review Journal’s “Best Of Las Vegas” awards once again! Congrats, Britney! It’s official Army. 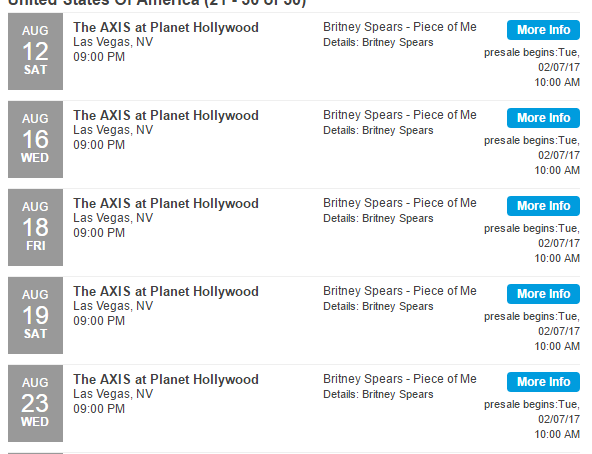 Britney’s “Las Vegas resicency is coming to and end and the final show dates have been announced earlier today. The dates goest from September 3rd to December 31st. There aren’t many dates so if you have the change, grab your ticket now and make sure to attend the last shows! AMEX Card Members will have access to an exlcusive tickets pre-sale on Tuesday, April 11at 10 am. General sale will be on Friday, April 14 at 10am PT. Good news Army!!! Larry confirmed in a new interview that Piece Of Me will end this December. We already knew that her contract ends this year but it could have been renewed but that’s not going to happen. But not everything is as good as it seems… Larry’s words seems to indicate that she may stay in Vegas but in a new theatre/hotel because she loves Vegas. Anyway… We really hope that this is the last year of Britney in Vegas. It’s time for a new album, lots of promo like years before and a world tour. It’s time to try new things and she has improved A LOT since the residency started, so It’s time to get out and try it. We have told you many times that Piece Of Me was NOT going to end in May as rumors said and now we have the official confirmation. Britney has added 12 new dates in August and September. Expect more dates to be added until December. Amazing news!! Piece Of Me ticket sales have now topped $100 million, according to Billboard!! Here’s the full article. More than 700,000 tickets have been sold to the Las Vegas-based residency. Britney Spears’ resident production Britney: Piece of Me at the Axis at Planet Hollywood in Las Vegas still has a few months to run, but the pop star recently passed a milestone as she entered the show’s homestretch. Ticket sales from the show have now topped $100 million, according to box-office counts reported to Billboard Boxscore by Caesars Entertainment, the producer of the show. With revenue reported from nine recent shows in January, the overall gross from the production now totals $103,399,634 since launching just over three years ago. Since the debut performance on Dec. 27, 2013, attendance has jumped to 710,418 through 197 shows. Spears’ debut at the Axis followed an extensive renovation of the venue to accommodate her production with an extended stage as well as lighting and sound improvements. During 2014, her first full year of residency, she played 58 shows and drew more than 234,000 fans to the casino venue. The original plans for the production included performances just through 2015, but in September of that year, Spears announced an extension of the run. The current Remixed & Reimagined version of the show debuted in February of 2016 and includes new songs from her most recent album Glory that was released last August. 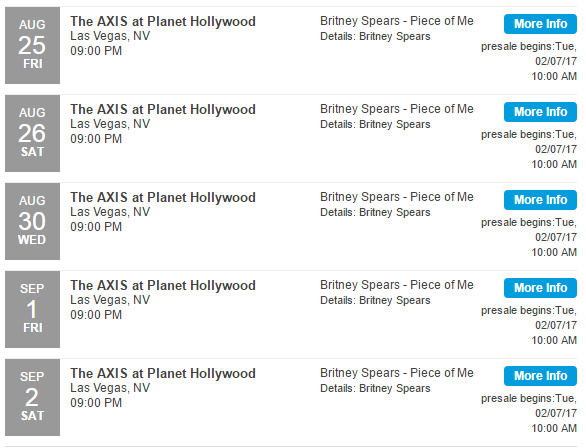 Now with less than three months of its run remaining, Britney: Piece of Me is booked for nine more performances in March and April, and finally for nine nights in May. Her last concert in the Axis is set for Saturday, May 20. Britney teased a “special surprise” for tonight’s show and we all thought that it was going to be a performance of the second single but no… The special surprise is that G-Eazy will join her on stage for Make Me (Be prepared for Make Me/ Me, Myself and I remix). G-Eazy was spotted at PH and he posted on snapchat that he was in Vegas. So, no second single for now… Sorry Slumber Party, we are still waiting for you! 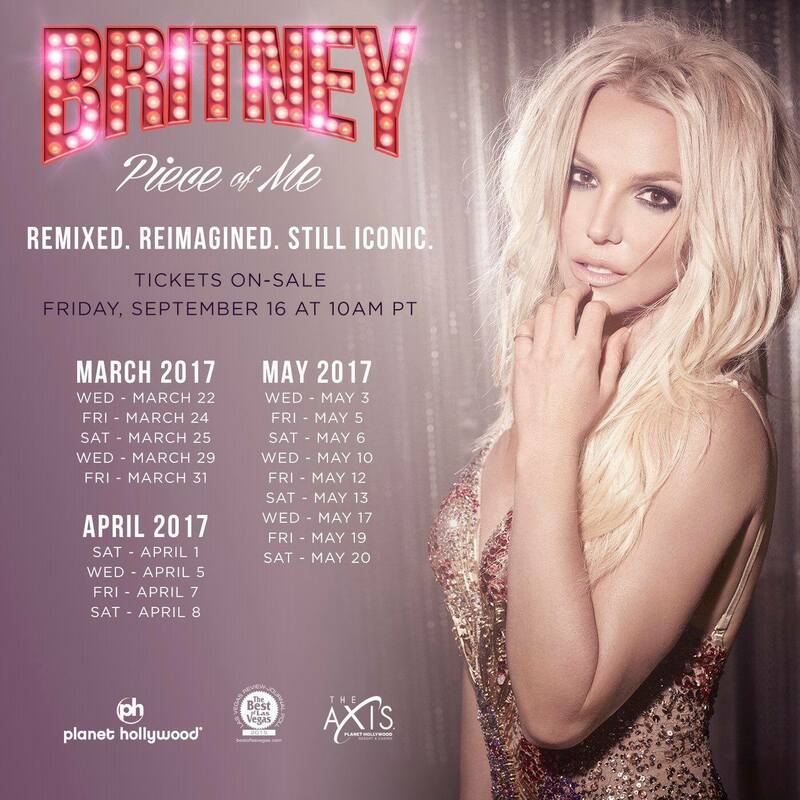 New dates for Britney’s Piece Of Me Las Vegas residency have just been added for March – May 2017. Yesterday, Britney returned to Vegas and the show had no big changes but Britney added “Make Me” to the show’s setlist. Interestingly, she also decided to add “Do You Wanna Come Over?” to the setlist, a song she released the same night. Watch the full “Make Me” and DYWCO performances below. Prette Girls was removed from the setlist.